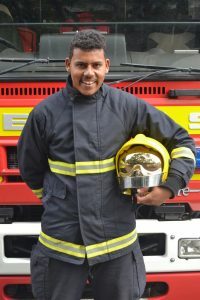 David Young of Ladder Hill has been appointed as a full-time Firefighter within the St Helena Fire & Rescue Service (SHF&RS) after originally joining the service as an apprentice in 2016. David started working with the SHF&RS in June 2016 as an apprentice through the St Helena Community College Apprenticeship Scheme. During his apprenticeship, David trained alongside the full-time firefighters to develop new skills and learn what it takes to become a fully competent firefighter, something which he aspires to be. During this time David also studied and successfully achieved a passing grade in Functional Skills – Mathematics Level 2. Recognising David’s hard work and commitment within the SHF&RS, be it on the training ground or attending real emergencies, he was given the opportunity to join the service as an Auxiliary Firefighter at the end of his two-year apprenticeship. In this role, David further developed his firefighting skills, which included attending live burn exercises at the St Helena Airport training rig learning how to deal with Aircraft Rescue and Firefighting (ARFF). He also attended and passed a two-week Rope Rescue course. On 1 January 2019, all of David’s hard work over the past three years was rewarded when he was offered the position of Firefighter within the SHF&RS. Since then, David has been training hard in order to past his competencies, which will allow him to further progress within the service. David’s daily duties include compiling fire safety reports, hydrant inspections, automatic fire alarm and extinguisher inspections, monthly maintenance of all fire service equipment, and training.